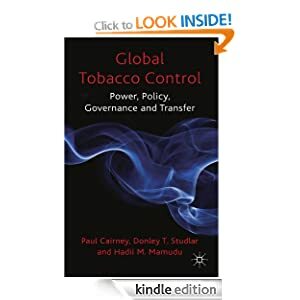 In the previous lecture we discussed multi-level governance and a tendency for policy responsibilities to overlap, even when they look separate on paper. In this lecture, we discuss how governments deal with the overlaps. The ‘take home’ message is that UK-Scottish Government relations have been generally informal and remarkably smooth, largely because they resolve potential disputes behind closed doors and have found a way to turn potentially controversial funding and legislative issues into dull routines. Is the UK a unitary or union state? Devolved territories have subordinate status, but the terms of the union protect (to some extent) some Scottish institutions (which ones?). Can it be meaningfully compared with federal or quasi-federal states? 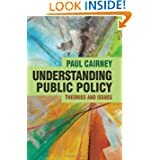 We can identify: the distribution of some legal, executive and fiscal powers to allow devolved territories a level of autonomy; ‘umpires’ to rule in disputes between levels of government (examples? ); and territorial representation at the national level (examples?). However, UK devolution is asymmetric (in what three ways?) and it lacks a supreme constitution to protect subnational bodies. What is the role of key organisations/ institutions? 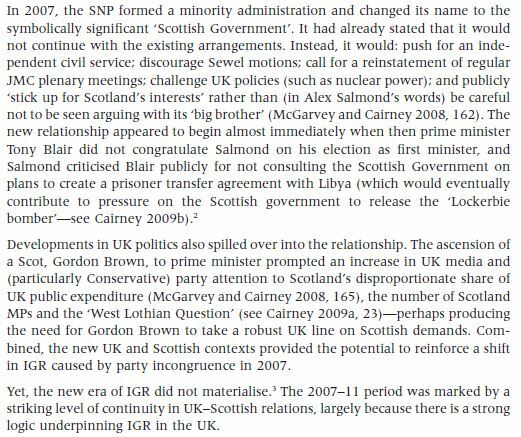 Until 2007, UK and Scottish Labour party links were important (an issue that we can revisit when discussing ‘policy convergence’). 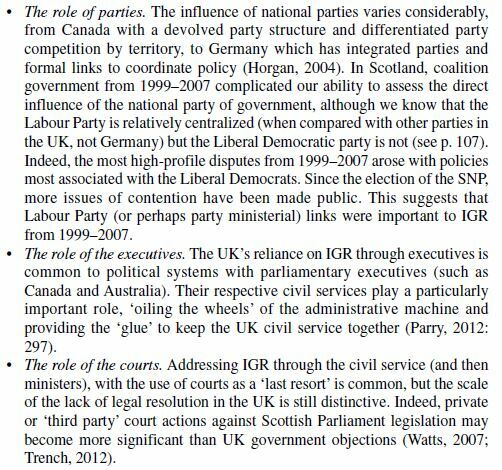 Also note that the coordinating role of the executives is far more important in the UK than the role of parliaments or the courts. How are issues generally resolved, and how often do governments resort to formal dispute resolution? The short answers are ‘quietly’ and ‘not’. Guiding documents, such as the Memorandum of Understanding between the governments, and individual concordats between departments, reinforce a sense of IGR resolution through convention/ cultural practices. Formal mechanisms for dispute resolution, such as Joint Ministerial Committees, are used rarely and Scottish bills are not opposed by the UK Government (compare with the process in Wales). Instead, both governments have preferred to use ‘bilateral’ and less formal links. 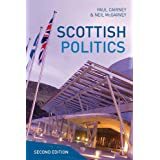 When policy overlaps involve legislation, the governments relied heavily on ‘Sewel motions’ or ‘legislative consent motions’ (LCMs), passed by the Scottish Parliament to allow Westminster to legislate on its behalf. Scottish ministers would identify expediency, heavily entangled responsibilities, the need to avoid loopholes, and the need to set up UK-wide public bodies, as reasons to pass LCMs. Or, the legislation would devolve more responsibilities to Scottish ministers. What happens when each government is headed by a different party? From 1999-2007, very few issues arose in public between the UK Labour government and Labour-led Scottish Government. A small number of exceptions, such as on free personal care, were perhaps linked to policy divergences promoted by the Liberal Democrats. Why were UK-Scottish Governmental relations so smooth from 1999-2007? One reason is that the arrangements suited both governments: Labour Party links allowed them to keep issues in-house; civil servants were able to conduct negotiations out of public spotlight; and, the ‘Barnett formula’ (next lecture) and Sewel convention allowed them to deal with financial and legal issues routinely. Another explanation is that the UK government is more powerful: the Scottish Executive struggled to get the UK to engage, and was reluctant to challenge UK authority. Although a focus on power generally dramatizes these innocuous IGR arrangements, their relationship on EU matters is instructive: the UK government saw EU affairs as reserved UK responsibilities, ‘rebuffed’ former First Minister Henry McLeish when he sought a stronger Scottish Government role (p134), and often ignored Scottish Government concerns (p100). 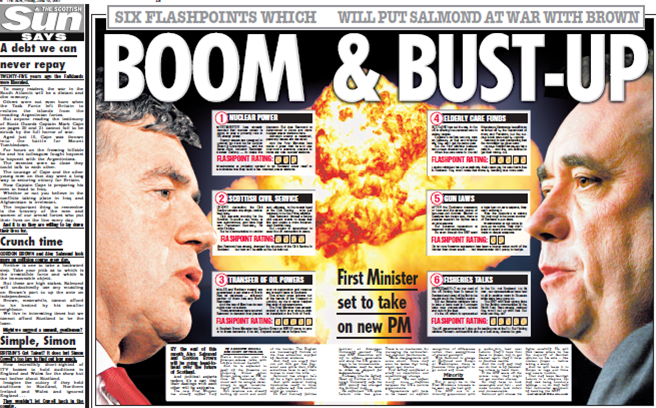 Why was there no ‘boom and bust up’ from 2007? Further, during minority SNP government, the more contentious issues between opposing parties – including the Scottish Government’s budget settlement, and the implications of a local income tax – played out in the Scottish Parliament, while the biggest bone of contention – a referendum on Scottish independence – had been delayed by opposition parties in the Scottish Parliament, not the UK Government. Did Conservative-led UK Government make a difference? A Tory government might be handy for the SNP’s electoral ambitions, and its favoured story on the need for independence, but Conservative ministers did not make it easy to portray them as aloof or top-down minded. Instead, David Cameron pursued a ‘respect’ agenda and gave his support to more regular formal meetings between UK and Scottish ministers via the JMC process. The SNP government has also been generally non-confrontational. Indeed, can you give me any examples of public disputes between the two governments? We might point to Scottish independence as the biggest and longest-running bone of contention between the SNP and Conservative or Labour governments. However, if you look at the way the referendum was designed and run, it has the hallmarks of negotiation and respect that we can identify in most other areas, including: Conservative government respect for the SNP’s mandate to hold a referendum, UK support to ensure the legality of the referendum and allow the Scottish Government to coordinate much of the process, and UK and Scottish Government negotiations on the wording and timing of the question. Indeed, the UK/ Scottish process may become an international standard, or model for similar countries to follow. In the next lecture, we will delve further into the Barnett formula, as one of the things that keeps IGR smooth, and then consider the likely effect of further constitutional change on these practices.